After the success of Vikings season 1 and the DVD/Blu Ray of the series. In March we saw the new season opening of Vikings season 2. 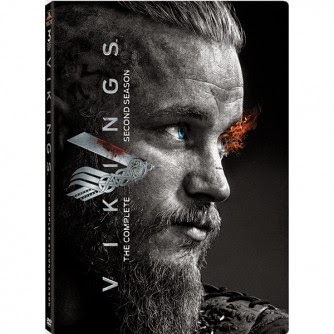 Today I found out that the DVD and Blu Ray from season 2 will come out on 7 October 2014 in the USA in Europe this will be 3 November 2014. We see Ragnar and his family brother Rollo, wife Lagertha and his kids Bjorn and Gyda on the farm. We meet Floki the boat builder and his girlfriend Helga. The madly powered Earl Haraldson who has one thing he would like most killing Ragnar because he has different ideas on sailing and navigating his lovely wife Siggy. After they raid they come back with a monk called Athelstan. When Earl Haraldson decided that he want to kill Ragnar he tricked Ragnar and badly wound him to dead. Ragnar finds out Rollo at the earl who tortured him to tell the hiddingplace of Ragnar, Ragnar wants a dual from men to men. After a duel with Earl Haraldson Ragnar became earl and started to live in Kattegat he decided to go to raid again. Lagertha get a miscarriage. In the first series Gyda died due to the plague. There are some extra footage on the DVD/Blu Ray behind the scenes. We will see the game between characters with words and without. Raiding started to get better. Great battle scene to start with. A marriage and lot of tricks of illusions. Wrong ideas and wrong explanations all to get us on the wrong foot about a few roles. Did we know how Floki would trick us. The outcome is great and surprisingly different from we thought it would be. With season 3 date to come soon it will be in March I think. We can’t wait for the next season. While waiting for this we are able to see, catch up on, and not have to miss them because they are on DVD/Blu Ray with season 2.